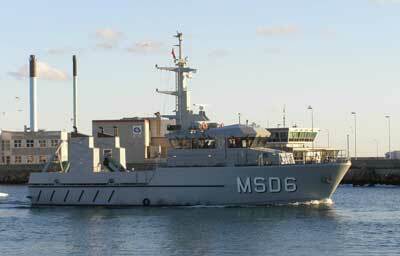 SALTHOLM, MSD6, leaving Skagen harbor in November 2007 on its final sea trials. Hauschildt Marine in cooperation with the Danish Defence Acquisition and Logistics Organization/Naval Material Command, Copenhagen and Danish Yacht A/S, Skagen. The vessels are built in a very flexible manner making it possible to solve several operational tasks. They have one flex container position aft that can hold environmental container, crane or stores.